Learn the eXtreme Lateral Interbody Fusion (XLIF) – Nuvasive surgical technique with step by step instructions on OrthOracle. Our e-learning platform contains high resolution images and a certified CME of the eXtreme Lateral Interbody Fusion (XLIF) – Nuvasive surgical procedure. The lumbar spine is commonly approached posteriorly but can also be approached from anterior and laterally. Trans-psoas lateral approaches to the lumbar spine have been described when Bertagnoli et al. first reported it for prosthetic lumbar disc replacement. The trans-psoas approach is designed to approach the lumbar disc space and allow good removal of disc material whilst avoiding the posterior neural structures. The anterior and posterior longitudinal ligaments are left intact to provide stability to the disc space but good disc clearance is achievable. In 2006 Ozgur et al. published what they termed the extreme lateral interbody fusion (XLIF) technique utilising the trans-psoas approach. Lumbar Lateral Interbody Fusion (LLIF) has grown in popularity and been adapted since then mainly through customised retractors and implants but it must also be recognised that there has been a large push from implant companies leading to a potential conflict of interest when critiquing any literature. LLIF aims to address the challenges and morbidity of anterior or posterior inter body fusion techniques but has its own risks and complications as a result. The main problems the lateral approach are iatrogenic injury to structures during the approach (kidney and bowel injuries are described), injury to the psoas muscle itself (leading to hip flexor weakness), and injury to the lumbar plexus which is contained within the psoas (injury risk increases with prolonged retractor use). The lateral approach is aimed to avoid the anterior vascular structures and especially the ilio-lumbar vein found at approximately the L4/5 disc space level. The case described here is using the NuVasive monitoring, retractors, and implants and is thus termed XLIF but the terms XLIF and LLIF may be used interchangeably throughout this surgical description. The eXtreme terminology is particular to NuVasive. The implants and equipment that have been developed by NuVasive are designed to make access safer (neural monitoring is attached to all dilators and is directional in nature), clearer (light attachment onto the retractor), and easier (the blades of the retractor can all be moved independently and the posterior shim docks into the disc space). Lateral lumbar inter body fusion (LLIF) is the same as that described as DLIF (Direct Lateral by Medtronic), XLIF (eXtreme Lateral by Nuvasive), and a similar technique to that described as ATP (Anterior To Psoas) or OLIF (Oblique Lateral) with variations in the approach but all have similar aim of approaching the disc space from the side and thus avoiding the vessels anteriorly or the neural elements posteriorly. The original LLIF technique called for two incisions and successive dilators with no direct look. The technique that has found favour and is employed here is one of slightly larger single incision (mini-open) and a more direct look and blunt dissection down onto psoas. 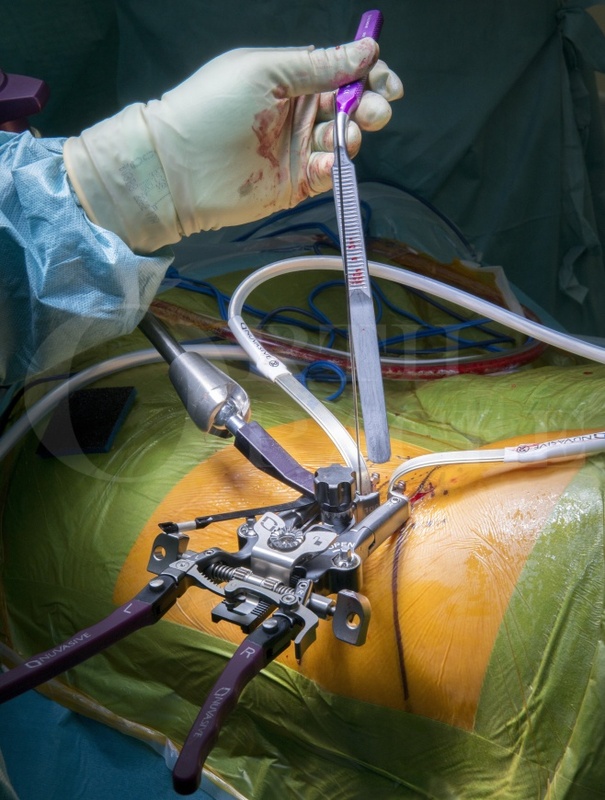 LLIF is grouped under minimally invasive spine surgery which has the intended benefits of reduced muscle dissection and trauma, reduced blood loss, decreased hospital stays, and reduced postoperative pain. Author : Mr Andrew Young FRCS (Tr & Orth). Institution : The Royal Orthopaedic Hospital, Birmingham ,UK.